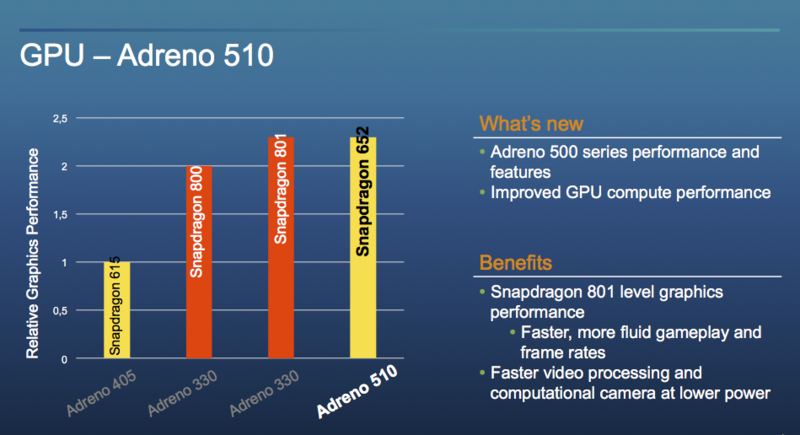 The Qualcomm Adreno 510 is a mobile graphics card for mid-range smartphones and tablets (mostly Android based). It is included in the Qualcomm Snapdragon 650 and 652 SoCs and based on the Adreno 500 architecture (like the Adreno 520 in the S820, which should be fully compatible in software). Compared the the faster Adreno 530, the 510 is currently produced in the older 28nm process (650 and 652) and should offer less ALUs. The clock speed is not disclosed. Early benchmarks and performance ratings from Qualcomm position the GPU on a level with the old Adreno 330 (former high end GPU) in the Snapdragon 810. Therefore, it should be able to handle most Android games up to Full HD fluently.